Screen printing is arguably most versatile in printing, almost everything can be used as substrate. 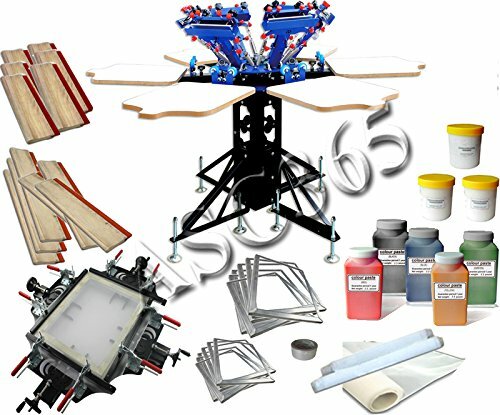 Our company provide this 6 color 6 station manual screen press package with high quality at a reasonable price, designed to easily set-up, register and print.This package is constitute of necessary screen printing equipments and materials. It can be applied to costume, woven fabric, metal, paper, copybook, plastic, wood, glass, ceramic, leather and other products which need flat printing. They are especially suitable for small enterprise and individual use. Main features Consists of four 24"(60CM) wide collets. Suits for any frames below 2" thickness (common thickness is 1"-1.2"). Wide locking bars for compressing screen are critical parts, directly influence the quality of stretching. We specially exploit concave and convex locking bars made of rubber with proper rigidity,24"width,no joints. Made of steel,advanced electrostatic spraying.